The past of Pukeora has touched many lives. Many have worked here, been cured here, lived here, a number of relationships have blossomed here and some poor souls have even died here. Pukeora translated from Maori means "Hill of Health". In 1918 the hill site with its abundant fresh air and altitude of 200m was chosen to build a sanatorium to care for soldiers returning from World War I with respiratory illnesses particularly mustard gas injuries. Soon afterwards the sanatorium turned its attention to the treatment of tuberculosis for the general public. When the Featherston Military Training Camp (WWI) decommisioned buildings for re-deployment they were offered to other government departments. 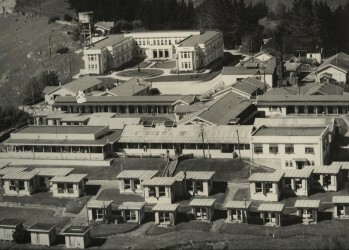 A number of the buildings were relocated from Featherston to Pukeora by rail around 1920. Included were the staff recreation room, a key hospital ward to become the isolation ward (now Manager's residence) and it is believed a couple of houses. These buildings are still on site today. For more details on the camp please see Featherston Military Training Camp and the First World War 1915-27 by Tim Shoebridge. The care for TB in those days was lots of fresh air hence the verandahs and shacks were open to the air. The photo above demonstrates this. To compare this photo to the present day see our Restaurant/Café page. During the 60 or so years of operation around 7,000 patients were treated for TB. The complex was redeveloped as a home for the disabled and physically handicapped from 1958. The complex was home for up to 80 long term residents, some for as many as 20 years or more. In later years as there was a decline in the number of disabled residents, the centre moved more to caring for head injury patients. In 1998 after the Regional Health Authority had decided that people with disabilities should be better cared for in the community, the home was closed and placed on the market for sale. The new chapter began when eventually Pukeora sold to private owners, Max and Kate in April 2000 (see Contact Us). Pukeora has been developed as a vineyard, winery and conventions venue, along with group accommodation facilities. To read the story of how we came to own a hospital and vineyard please see "How did we get here ?"